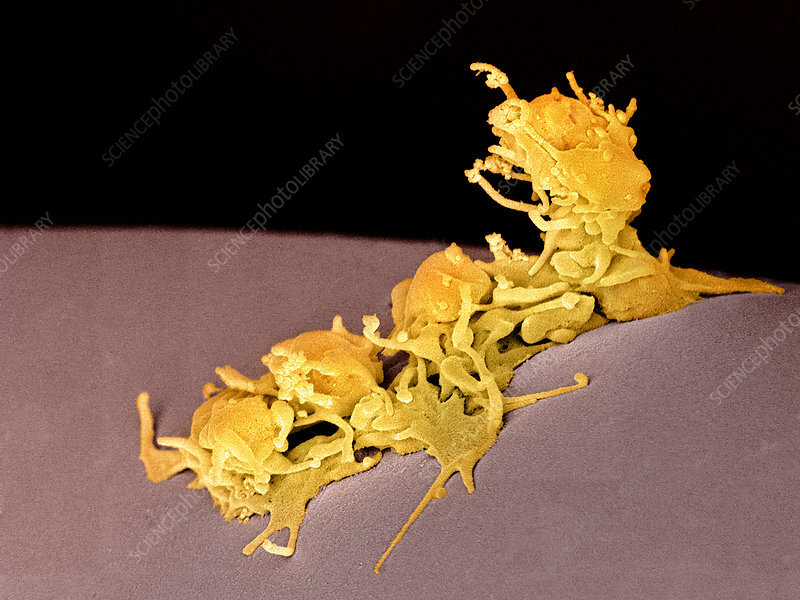 Activated platelets growing on a filter, coloured scanning electron micrograph (SEM). Platelets are cell fragments that circulate in the blood and contribute to blood clotting. Under normal circumstances, they are small and biconcave in form. However, if there is a break in the surface of a blood vessel, the platelet will come into contact with molecules not normally present in the bloodstream. These molecules, of which the protein collagen is an example, activates the platelets. They become amorphous in form, with long projections that help them adhere together. The platelets thus form a clot over the site of the break. Magnification: x3500 when printed 10 centimetres wide.